Beef Rib Burnt Ends – Bye Bye Brisket! Question: what looks like brisket, tastes like brisket, but is far easier to cook than brisket? Beef short ribs, that’s what. I actually prefer to cook beef ribs at competitions to brisket as beef ribs are more forgiving and more ‘set and forget’ than brisket, allowing me to focus on the more fussy hand-ins. Like chicken. Of course, I can only do this in ‘open’ beef categories and not categories specifically for brisket. Handing in beef ribs in a specific brisket category will get you disqualified quick smart! Beef ribs are also great for small families who want that big beefy flavour but don’t want to cook a whole brisket, and also those who are on a tight budget and can’t afford a whole brisket. Now there are several ways to present these ribs, but in this article, we’re going to look at Beef Rib Burnt Ends. When you’re looking for beef ribs, you typically find them cut two different ways – into racks of three or more bones, or into single bones. For Beef Rib Burnt Ends, you’re going to need to get racks of at least three bones. If you’re doing this for a competition, three bones is the perfect size for slices, which we’ll talk about later in the article. You’ll need four racks too – two for slicing and two for the burnt ends. Thickness is important – we’re making both beef rib burnt ends and slices so we want ribs with at least 5cm / 2 inches of thickness. Furthermore, this thickness needs to be uniform. The more uniform the better. Of course, if you’re cooking at home, it’s less important, but for competitions, naturally, it’s very important. The next thing to look for is marbling. You want some ribs with some good marbling. This will help your ribs be moist, rich and delicious. Here’s a tip for competitors – when you are ordering your ribs from your butcher, have the butcher square them up for you. You want a nice rectangle. The butcher can do this with a band saw in no time at all. Trimming up beef short ribs is a lot easier than trimming up a brisket. Firstly, you want to take all the fat off the top. If you cant get all of it without digging into the meat, then leave it there – it just means that the meat is thinner at that point. If you remove that fat the meat will cook unevenly. Like pork ribs, you also want to remove the film from the back. Because of the way we’re going to present them, this is not as important so you can even get away with just scoring the film with a knife. If you do nothing, you run the risk of the film contracting in the heat and bending your rack. Finally, like any cut that you’re cooking low’n’slow, you need to remove any little dags that might be hanging off the side of your beef rib rack. For competitions, I always inject my beef ribs, and I use my standard beef injection recipe, which you can find as part of my Picanha recipe. If you’re cooking at home, you probably don’t need to worry about it, but it certainly won’t hurt. When it comes to seasoning beef, you can keep it simple or go as complex as you like. True Texan style is a 50/50 mix of salt and pepper. I like to use sea salt flakes and freshly cracked black pepper. Be aware that different grain sizes of salt will result in a different final amount of salt in your recipe, even if you’ve used the same sized measurement. For example, a tablespoon of sea salt flakes will be a lower salt content than a tablespoon of table salt. If you want to try something more exotic you can try my Beef Spice Rub Recipe – it’s complex and cheeky and has a few ingredients in it that you wouldn’t expect but will love. If you’ve injected, some of it will leak out and moisten the surface of the rib. This moisture will help your rub stick to your ribs. If you want to you can use a little bit of olive or peanut oil to help stick the spice rub to the meat. I actually don’t bother with oil if I’m not injecting: I find that the natural moisture of the meat will be enough to make the rub stick. Oh, and sprinkle and pat. Always sprinkle and pat! I have set rules when I’m cooking beef ribs, whether I’m preparing Beef Rib Burnt Ends or not. I always cook at 275F / 135C. Typically, beef ribs will take 8 – 10 hours to reach an internal temp of 203F / 95C. I find that the higher cooking temp of 275F renders more of the fat out of the rib and results in a better-textured rib. If I’m cooking Beef Rib Burnt Ends on my Radar Hill Vertical Offset Smoker, I use Iron Bark and a little Oak. If I’m cooking on charcoal, I use gidgee lump and oak. No matter how I cook them, I always use a water pan. For me, this means I don’t have to worry about spritzing nearly as much. While beef ribs are pretty much ‘set and forget’, I do wrap them with foil at 160F / 71C. This serves two functions: it will get you through the stall and also collect the juices which you can reserve for use later. For competitors, look at your 4 racks and choose the two most uniform ones – these will be used for your slices. The other two will be used to make your Beef Rib Burnt Ends. For now, let the sliced racks continue resting while you’re finishing up your burnt ends. Take the two burnt end racks and turn them on their end so the rack is standing on the ends of the bones. 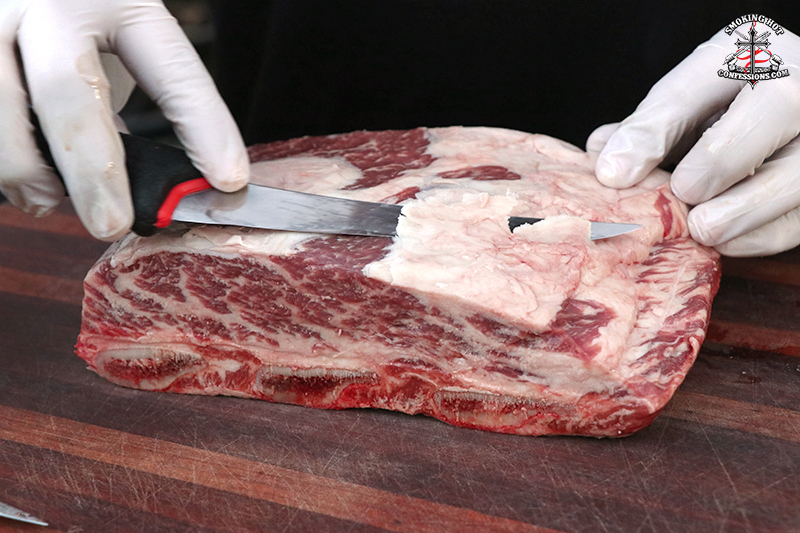 Slice all the meat off the bones, running your brisket knife (you’ll be calling it your beef rib knife from now on!) between the bones and the meat. This will leave you with a big rectangle of rib meat. Have a quick look at the back of the rectangle of meat and tidy it up if you need to. There might some connective tissues left back there. Slice these two meat rectangles into 4 cm / 1 ½ inch cubes. Check these for uniformity – you might have to trim a little off the bottom to make sure they are all the same height. 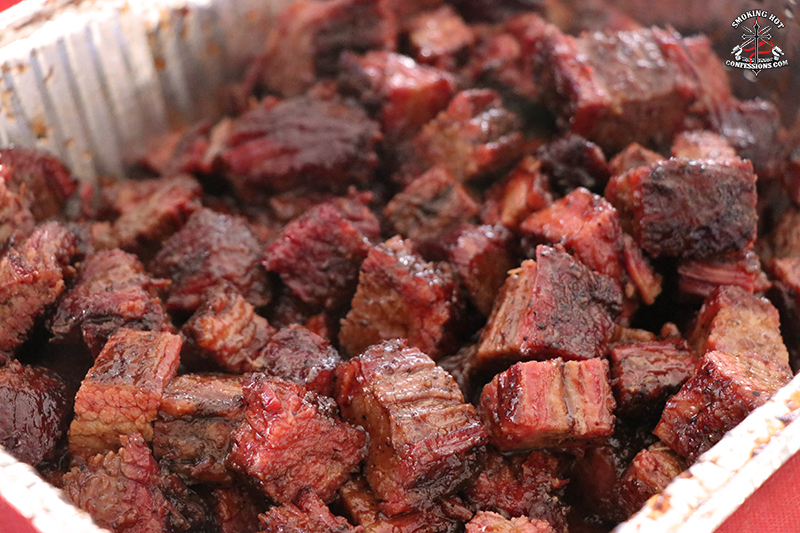 Apply more rub, and dip the Beef Rib Burnt Ends in a warmed sauce. Place them in a tray and return them to the smoker to set the glaze. I don’t let them stay there for more than an hour. When these are almost done, take your last two racks and slice the meat off the bone as discussed above. Then you can slice the meat rectangles against the grain into pencil-thickness slices as if it were brisket. Then, simply present them in your box as if you were serving up brisket. It’s a good idea to then paint the slices with some of those reserved juices – just make sure you’ve kept the juices hot so you’re not painting cold juices onto your hot slices! Job done! So now you know about Beef Rib Burnt Ends, and you know why they’re awesome. You get the big beefy flavour without necessarily having to cook an entire brisket, which also saves you money. You’re only cooking one muscle instead of two like you do with a brisket so there’s less worrying and fussing. And they are incredibly easy and ‘set and forget’ to cook. Get out there and get into it! Share some pics of your efforts in the comments below. Final Point: If competing, this is a great technique for ‘Beef’ or ‘Beef Rib’ categories. You will be disqualified if you hand in beef ribs in a ‘Brisket’ category. Moreton Bay Bugs – Lucky they taste great! A Cuban BBQ Pork Recipe with bite!